This is one of the soaps we made for our Christmas soap display at Otion. 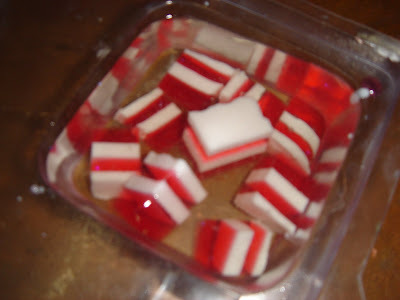 The red and white chunks are made with clear soap colored with Labcolors Red and white melt and pour soap. We made the flat layers in a cake pan, chopped up the layered soap and then embedded the chunks into a Milky Way Square Mold. I’m in Seattle today, with Erik from Otion, to plan our 2008 Action plan. It will be a light posting day. Saturday, I’ll be working at Otion doing soapmaking demos for our holiday crafters. If you’re around, stop by to see the holiday soap! We made all kinds of soap – Soap for a group of monks in Rome, soap for testing and multiple Christmas present soaps at the soap bar. It was tons of fun! It’s boring stuff but needs to be done if we want to move the company forward. Oh I wish I lived closer! I would love to come to Otion and make soap with you tomorrow. What kind of soaps will you be making?